It was my neighbor's kid who had the piano lessons first. And then I was just being the saling-pusa that I am -- I distinctly remember the piano teacher giving me a few pointers already at my neighbor's house. I guess my neighbor complained to my parents because I was freeloading :P Hahah. Or maybe the teacher saw some "potential" and told my parents about it. And so, one weekend in Cubao (I can hear/see Fiesta Carnival in my memory bank right now), we bought a decent piano, for me to develop my musical abilities. We officially hired the piano tutor, and when I got to pre-school, they enrolled me in the music center. After four memorized piano pieces, two recitals, countless finger exercises (so that I'd hit the piano keys in just the right way -- not too soft, not too hard), and endless practices, I gave up piano lessons in my third grade. 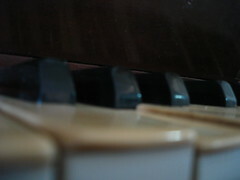 Maybe I got bored, or maybe my mom saw no more reason for me to continue, but I just dropped everything related to piano. But, I can still play the first few bars of my first recital piece, I still have those long pianist's fingers, and I can still read musical notes. I'm so grateful my parents gave me this grand old thing years ago -- I wouldn't know music without it. And I wouldn't know what cool music was without my dad's vinyls. We had so many Beatles' albums, Kenny Rogers, a few Paul Anka ones, a Simon and Garfunkel album, John Lennon's Imagine, Michael Jackson's Bad, Cyndi Lauper's True Colors, U2's The Joshua Tree, a few compilation albums (love songs, disco hits, most requested songs) and of course, his jazz albums. I embraced the Beatles and U2, while I was already mildly interested in Michael Jackson and Cyndi Lauper (this was around the 1990's). Sayang, I wasn't able to appreciate his jazz albums. I guess I got too sleepy or bored when he played those hehehe. A few years ago, I wanted to make bags with the album covers of dad's vinyls and record bowls with the plaka themselves. Good thing he put some sense into me, and made me realize that these albums are relics. And a reminder to both of us on how he passed on his love of music to me. He had a wide variety of tastes in books -- he had the classics like The Brothers Karamzov, Crime and Punishment, Great Exptectations, Anna Karenina, and a really ancient copy of Homer's The Odyssey. He's got the science fiction books (mostly short story compilations), chick lit (Margaret Atwood's Dancing Girls and Edible Woman), scary stuff (Stephen King and Ann Rice), new age (The Handbook of Parapsychology, The Bible and Flying Saucers -- what the?) and a whole bunch of James Michener (Space, Alaska, Poland, The Source, Legacy, The Covenant, Texas, The Drifters, Journey, etc). I haven't even read half of those books on that shelf! I am so going to inherit these books.